Economists worry quite a lot about structural unemployment. Essentially this boils down to unemployed individuals who do not have the skills required for the available jobs, so they remain unemployed (or drop out of the labor force). Solving structural unemployment problems is much more challenging. It requires retraining workers, possibly including relocation, which is both time consuming and expensive. If much of the economic slack is cyclical or frictional then solving the problem is easier. The answer is stronger economic growth, usually with fiscal and/or monetary policy. Stronger growth results in more sales for businesses who need to hire more workers. In Oregon, we have the latest job vacancy survey from the Oregon Employment Department to try and see what exactly is going on in the labor market. Breaking down the needs of businesses, in particular what they cannot find, with what the workforce is offering in terms of available employees is important and can help shed some light on the different types of unemployment in the state. Our friends over at OED Research (thanks Jessica and Nick) were kind enough to share some of the difficult to fill job data by occupation. Overall there is not much of a relationship between unemployment rates and the share of jobs that are difficult to fill. Occupations with both high and low unemployment rates have a wide range of difficult to fill jobs. Overall this is actually encouraging. No one sector or occupation is sticking out like a sore thumb. Much like the previous discussion on the Beveridge Curve — where research found no evidence of labor market divergences along age, educational attainment, region, or industry lines — the issues appear to be broader in nature, a general malaise rather than a specific one. The reason this is good news is that it points more toward cyclical or frictional unemployment, or low levels of aggregate demand, and less toward the dreaded structural unemployment. Broadly speaking — our office, not OED — the reasons jobs can be difficult to fill can be roughly divided into 1/3 due to underqualified applicants, 1/3 due to employer issues (low wage, work conditions, etc) and 1/3 due to other reasons. I think it is the first group — our so-called underqualified applicants — that are the most interesting. If the labor force is not providing enough, good applicants to fill positions, then it becomes a much broader issue in terms of the labor force, education, workforce training, etc. Employer issues are important to track as well, but they may be more easily improved with higher pay to entice more applicants, as one example. Focusing just on the realm of underqualified applicants yields the following. Here you do see some patterns. First, occupations with high unemployment rates — indicating a large pool of candidates from which a business can hire — report lower levels of underqualfied applicants being the reason jobs are difficult to fill. Occupations with low unemployment rates — indicating fewer potential workers — report that finding a qualified workers is more challengeing. This is the pattern one would expect to see. When there are lots of workers to choose from, finding a qualified worker is not the problem. When there are few workers to choose from, it is. Again, this generally points to low levels of economic growth being the primary culprit and not structural unemployment. Second, when looking at the occupations by wage group, the pattern of job polarization is also apparent. 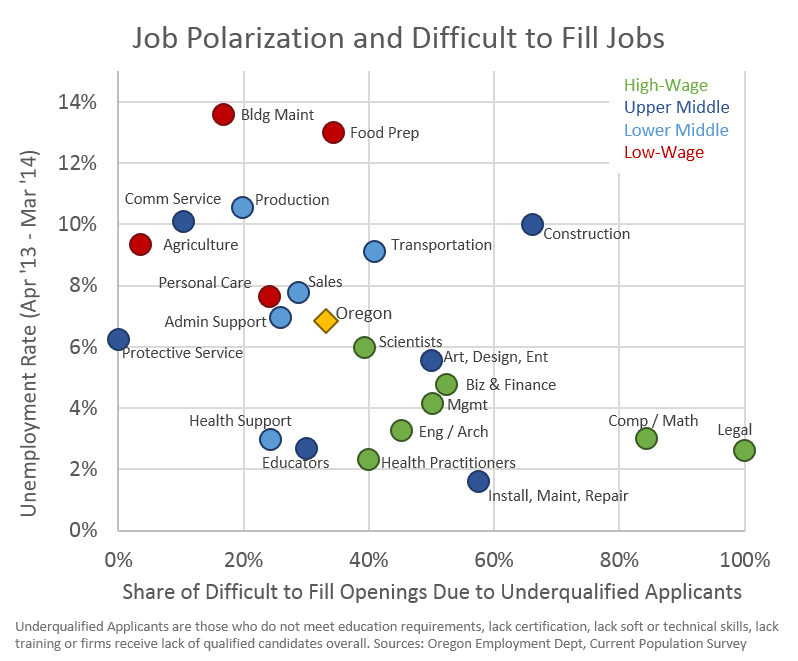 In the first graph, the high-wage (green) occupations are generally easy to fill overall, however when it comes to the specific reasons, it is primarily due to underqualified applicants. This makes sense given that high-wage occupations are high-wage largely because they require a specific skill set, or specialized knowledge or training that is not as widely available. Low-wage occupations have higher unemployment rates but do not have difficulty with underqualified applicants. These occupations face other challenges to fill like low wages. Middle-wage jobs are more dispersed across unemployment rates, difficulty to fill and the reasons for this. However they are generally somewhere between the positions of the high- and low-wage occupations. 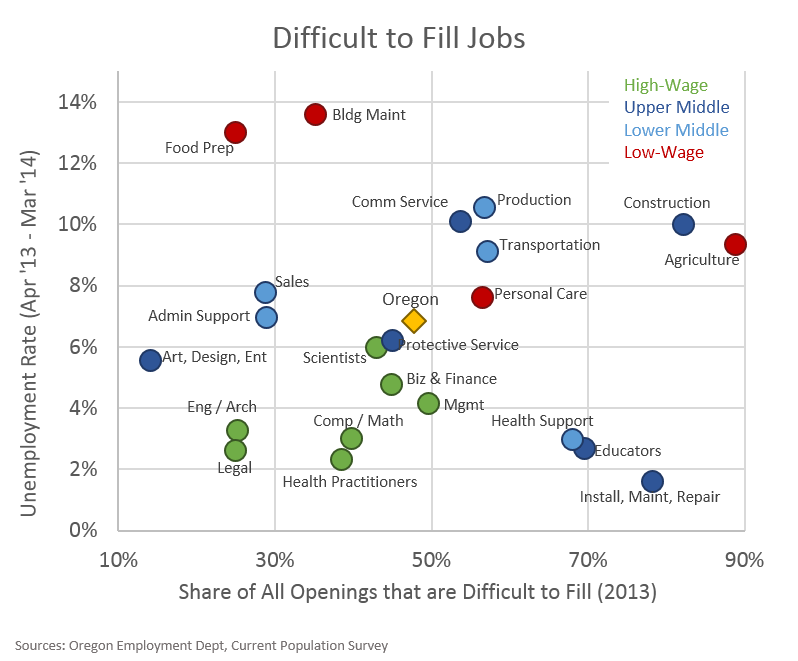 Overall, underqualified applicants are not the primary reason jobs in Oregon are difficult to fill. When they are a larger barrier, it largely has to do with specific skill sets, which is likely the case in both good times and bad. Unemployment still remains too high but much like the Beveridge Curve research, the slow rate of hiring cuts across many categories and points more towards an overall lackluster recovery than any specific industry, occupation or region. Now that job growth is accelerating in Oregon, and some of the hardest hit industries are improving, expectations are for the number of unemployed to continue to decline, but for a good reason: more jobs. To be sure, some of the damage from the Great Recession is permanent and some workers do face structural challenges. Providing opportunities for training is very important for the workforce overall, but particularly for those facing these structural issues. Note 1: The unemployment rate for each occupational group is the 12 month average from April 2013 through March 2014, based on the underlying Current Population Survey data. Note 2: Construction is somewhat of an outlier in terms of difficult to fill jobs and those due to underqualified applicants. Given the industry fell 36 percent (38,000 jobs) due to the housing bust, it can be hard to say there are not workers available. However, this may be one area in particular that long-term unemployment is an issue. Job finding rates for the long-term unemployed are very low and only increasing slighlty in recent years. Given construction fell first and declined further than most industries, there are likely many more long-term unemployed construction workers, which firms are not hiring in great numbers. Note 3: Our office has recently been using the Current Population Survey more frequently (HH formation, Stay-at-Home Parents, etc). The sample size in Oregon is small, so some of the specific figures do need to be taken with a grain of salt, relative to Census or ACS data. However the general patterns are clear, and likely correct. 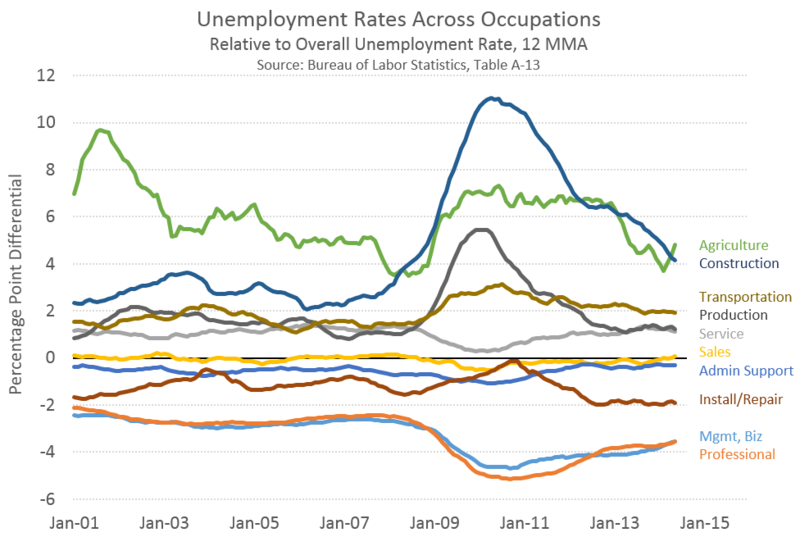 For example, occupational unemployment rates for the U.S. overall that BLS does publish, are shown below, and indicate the same pattern as the Oregon figures above.